A key for Fiat car manufactured between 1970 and 1995 cut to number or photo. Models Include: 500, 600, 850, 1100, 1300, 1500, 1800, 2100, 2300, 124, 125, 126, 127, 128, 147, 148, Dino Coupe, 126, 127, 128, 130, X1/9, 131, 132, Argenta, Ritmo, Strada, Campagnola, Regata, Panda, Duna, Elba, Premio, Uno, Tempra, Croma, Tipo, Cinquecento, Coupe, Barchetta. 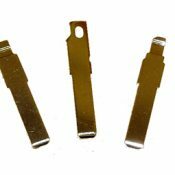 We do not use original Fiat blanks, we use high quality steel blanks manufactured by Silca. A key blade to fit Fiat key remotes, cut to the locks on your car. Models include: Daily 2000-2008, Doblo 2000 on, Ducato 2002-2008, Idea 2003-2008, Panda 2002 on, Punto 2003-2008. The key number is likely to have the prefix DE followed by 5 numbers, e.g. DE10374. 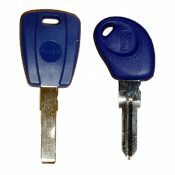 A car key for Fiat cars cut to number or photo. This key will open the doors and turn the ignition, but it will not start the engine without a transponder chip. 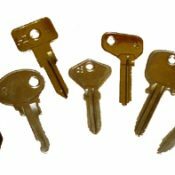 If you require a transponder key, please contact us for price and availability. Models include: 500 2007 on, Barchetta 1995 on, Brava 1995-2007, Bravo 1995-2007, Cinquecento 1995-1998, Coupe 1995-2000, Croma 1995-2000, Daily 2000-2008, Doblo 2000 on, Ducato 1996-2008, Fiorino 1995 onwards, Grande Punto 2005 on, Idea 2003-2008, Marea 1996-2002, Marengo 1996-2002, Palio 1996-2001, Panda 1995 on, Punto 2003-2008, Qubo 2008 on, Scudo 1996-2002, Sedici 2008-2008, Seicento 1995-2008, Stilo 2001-2007, Tempra 1995-1996, Ulysse 2002-2008. A car key for Fiat cars cut to number or photo. This includes the transponder chip, which will need to be programmed to your car in order to disarm the immobilise and start the engine. Models Include: Barchetta 1995-2002, Brava 1995-2000, Bravo 1995-2000, Cinquecento 1995-1998, Coupe 1995-2000, Croma 1995-2000, Ducato 1996-2001, Marea 1996-2002, Marengo 1996-2002, Palio 1996-2001, Panda 1995-2002, Punto 1995-1999, Scudo 1996-2002, Seicento 1995-2004, Tempra 1995-1996.